Rick Smith, the founder and CEO of Hope Story is the father of a child with Down syndrome who has made it his mission to make resources and support available to other parents as they initially get that Down syndrome diagnosis. Smith spoke at the 2019 March for Life Conference Thursday and described his experience with his son Noah and the organization that sprung out of that. “We were surprised to learn about three hours after his birth that he was born with Down syndrome,” Smith told those gathered at the conference. He then pointed to the alarmingly high termination rates in the U.S. and Europe that follow a diagnosis of Down syndrome. He also responded to the push to “eradicate Down syndrome” through abortion in Iceland, where the Down syndrome termination rates are nearly 100 percent. “When we talk about eradicating Down syndrome, we’re not talking about eradicating a disease, we’re talking about eradicating an entire people like my son and his friends,” he emphasized. Smith relayed several stories of friends who were counseled, and even pressured, by doctors to get an abortion after a prenatal diagnosis of Down syndrome. “There are doctors out there these are folks that we trust, these are folks who took an oath to help us that say ‘hey I can help you terminate that child simply because they have three copies of their 21st chromosome,’” he said. Smith said that there were two problems, he thought, that led to the prevalence of this sort of advice. Smith’s organization “Hope Story” is aiming to fix those problems. Following his speech, he explained how his group accomplishes this mission to Townhall. 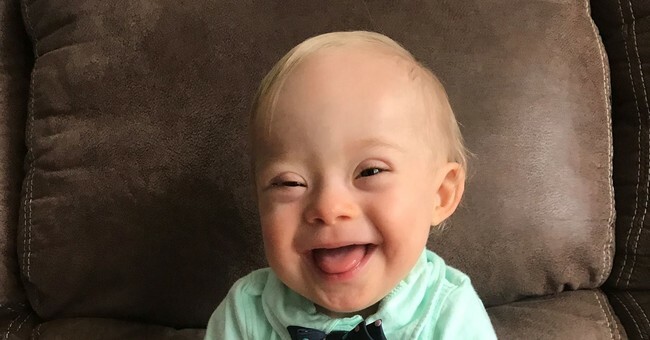 “Our goal is to connect every OBGYN in America to a family raising a child with Down syndrome so that in turn they can connect their patients who have a child with Down syndrome to our hope advocates, we call those families hope advocates,” he explained. “We give them resources, we help them to share their story,” he said, emphasizing that the goal is to provide a support network for these families. He said there are several, important messages he would pass on to a family that’s just received such a diagnosis. He said he believes Noah's story is the reason some children with Down syndrome are alive today. Smith said he thought it was a “good thing” that the Supreme Court is being asked to consider a law that would ban abortions that are chosen solely because of a diagnosis of Down syndrome. “My hope is that it’s not just children with Down syndrome in the womb that we protect but all children in the womb,” he added.